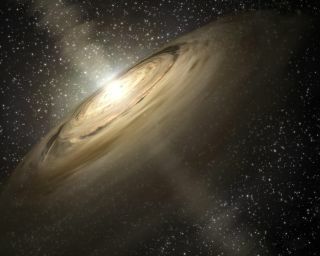 An artist's depiction of gas and dust creating planets around a young star. The building blocks to create another Earth are found at solar systems across our Milky Way galaxy, a new study reveals. By saying that carbon, oxygen, magnesium and silicon are in rocky planets everywhere, this new study contradicts previous research that's said only some rocky planets have this recipe. Previously, scientists said there were three kinds of rocky planets: those similar to Earth, those that had more carbon, and some that had a lot more silicon than magnesium. "Too much magnesium or too little silicon, and your planet ends up having the wrong balance between minerals to form the type of rocks that make up the Earth's crust," Gibson added. "Too much carbon, and your rocky planet might turn out to be more like the graphite in your pencil than the surface of a planet like the Earth." The new results come from a simulation of how the Milky Way formed. While Gibson said he was worried at first that the model was wrong, he added that it predicted different parts of our galaxy correctly — such as how frequently stars formed and died. The researchers also examined observations and found uncertainties concerning how many rocky-planet systems had recipes similar to Earth's. "Removing these [uncertainties]," Gibson said, "observations agreed with our predictions that the same elemental building blocks are found in every exoplanet system, wherever it is in the galaxy." Specifically, the uncertainties happened because observations tend to come from large planets that are orbiting bright stars, which are easier to see from Earth. This creates uncertainties of 10 percent to 20 percent, the researchers said. Also, oxygen and nickel spectra are hard to see from a distance, which adds to the uncertainty. Newer techniques will make these observations more accurate, the researchers added. The research was presented Wednesday (July 8) at the National Astronomy Meeting in Llandudno, Wales.